Was That Me Going Through Your Trash? So, I’ve taken up running, though only when the weather conditions are optimal, and even then only to the end of my block. (Full disclosure–I used to run seriously, when I was a wee teenager, but I was a sprinter then and I’m certain I just don’t have the right muscles for distance…it’s something about fast twitch vs. slow twitch, right? Can anybody back me up here??). Anyway, even if I’m not yet getting that “runner’s high,” I am enjoying the act of eyeing the neighborhood garbage while running past on trash pick-up morning. 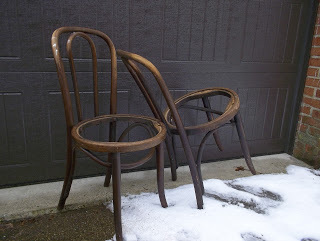 People throw some cool stuff away, like these antique bentwood chairs. Turns out these chairs were in the trash right next door, so I didn’t have far to walk to take them home. Like most of my DIY projects-in-waiting, the chairs then found themselves nestled into my small garage (which has never actually contained a car) until I decided last week that it was time to give them a new life. My two kids had outgrown their little toddler table where they do arts and crafts. One of their tiny chairs had finally succumbed to years of heavy use and snapped. It was time to get them a new, big-kid set-up. 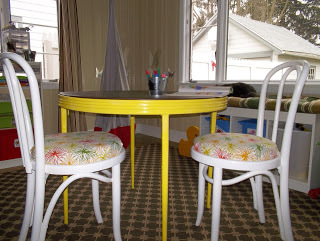 I’d recently spiffed up a round, metal vintage folding table I found at an antiques shop using some sunny yellow spray paint and adding a new vinyl top (perfectly wipe-able for kids’ messy projects). 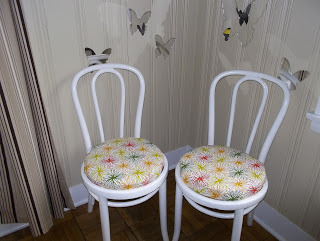 I sanded the trash-picked chairs and, with my dad’s help on a recent visit, cut the seats from scraps of plywood. Yes, I used a jigsaw on this project! I have a natural, and healthy, fear of power tools, being that I need my hands to keep at my writing career and all. But, once I got going, it was kind of fun, in a white-knuckled, don’t slip and take a finger off kind of way. Upholstering is easy-peasy. Foam, fabric, staple gun. I’d recommend it to anyone who’s looking for an easy DIY. Fresh white paint in a high gloss (for easy cleaning) and…new chairs. We had most of the supplies already around the house. I spent ten bucks on fabric, for both the chairs and the table. Here’s something I love about these little DIY diversions from my writing–a distinct before and after. It’s sometimes difficult to decide when a writing project is “done.” If my deadline is strictly self-imposed, I can fiddle around with a piece forever. Sometimes, it’s nice to take a break from the nebulous fictional worlds I’m creating, and rev up some power tools, take a piece of wood… Hey, this was a square, now it’s a circle, now it’s a chair seat, now I’m sitting on it. I’m looking forward to my next trash-to-treasure (I’m looking at you, broken printer cart!). So impressive and professional looking! I'd keep your pace to a jog as it will afford you better trash scoping. Running is moving way too fast–think of all the treasures you'd miss. E, yes, sewing I can see working, too, though I don't have that skill. Wish I did!